Committed to honoring traditional techniques combined with the finest ingredients Sonoma County has to offer. They make all of our noodles in house and strive to produce and preserve as much as possible in season. They offer a seasonal menu consisting of traditional regional ramen styles informed by the offerings of our local farmers and ranchers. Ramen Gaijin is dedicated to providing a shared community space that brings together all walks of life under the umbrella of good food, good drink and joyous atmosphere. Williams and Hahn-Schuman come from the Woodfour Brewing Co. in Sebastopol’s nearby Barlow complex, where they were the talented sous chefs to the innovative Jamil Peden. 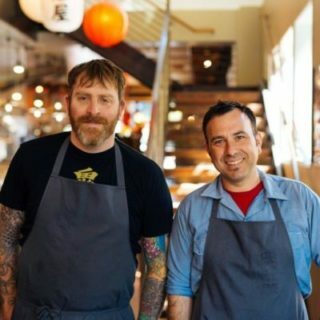 When Peden left to take the reins at Applewood in Guerneville, these two packed up their talent and reinvented themselves as Ramen Gaijin.